Down on the streets of St. George, UT lies a beautiful, hip treat of Peruvian cuisine; Viva Chicken (Peruvian Rotisserie Joint specializing in Pollo a la Brasa (Roasted Chicken)! If you’ve ever been to Peru for vacation, you won’t be disappointed (can’t say the same if you grew up in Peru, cuz you know, nobody cooks better than mama)! You are transported back to the memories of fresh food, refreshing drinks, flavorful sauces, the smell of Peruvian spices and good healthy food! If you’ve never been to Peru, your in for some fun! 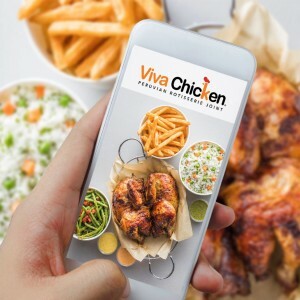 Viva Chicken is quick, convenient, and only offers fresh ingredients, with the chicken NEVER being frozen. The chicken is also “100% natural, hormone free and cooked fresh every hour in a hand-built, charcoal fired oven imported from Lima, Peru.” There is a great variety of foods you can order from 1/4 – whole Pollo a la Brasa, big hearty salads, sandwiches & wraps, soups, delicious rice dishes, saltado (sirloin dish) to delicious sides such as yuca, fries, fruit, plantains, green beans, rice, canary beans, quinoa, and salads. Also, we can’t forget those yummy desserts; churros and tres leches! For drinks you can get Maracuya (passion fruit) juice, Chicha Morada (purple corn with hints of pineapple, apples, oranges, cinnamon, & cloves (a must try! )), herbal lemonade (lemons, limes, rosemary, & mint), Inca Kola (think cream soda infused with a hint of bubblegum), water (reg and sparkling) and soda. You can dine in or, if you’re feeling adventurous, order ahead (online or with the app (mac/android)) and pick up later. We are giving away tickets to ODT’s “Thriller” at Tuacahn!